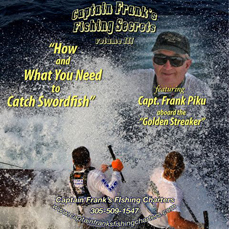 Get Your Copy of Captain Frank’s FREE Full Length Muskie Video on DVD! My new DVD Video is now released for anglers wanting to catch Swordfish!!!!!!!!!!!!!!!!!!!! This exciting 30 minute video is your instructions on how to catch these Monster Fish. Captain Frank tells you all you need to know and what to use!!! Get this DVD today for only $24.95 plus $3 for shipping and handling! How To Catch Muskie contains 30 minutes of instruction on how to catch these elusive monsters. How To Catch Grouper and Snapper will show you how I catch 30 to 40 Grouper in a days fishing plus many snappers too. How To Catch Grouper and Snapper on a Fly Rod will show you how I catch 30-40 Grouper plus many snappers on a fly rod in a days fishing.